I am moving all my clients off of GoDaddy and BlueHost. – because their servers are too slow and they have downtime and charge a fortune to make site HTTPS/SECURE. GoDaddy service is awful and they are in financial trouble. 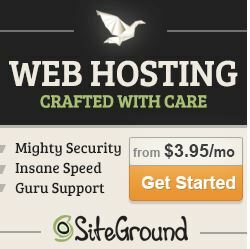 I Recommend that you Switch to SiteGround for your Web Hosting. When you go to SiteGround sign up for WordPress Services and the STARTUP PLAN which is $3.95 per month for hosting, it includes SSL so your site is encrypted and will be https. Please also pay the extra $12 per year for their security plan. Total charge will be about $60 for the year. When you sign up the the account you can add your existing domain name.Nothing will happen to your Godaddy or BlueHost site, it’ll still be live. I will have SiteGround transfer your site over (FREE!) and then I wilI login to your GoDADDY/BlueHost and change the server pathway and add some plugins on your WordPress site to make sure everything is working OK! You will love the security and the SPEED!